Eco-Friendly Body Fluid Spill Kit allows foodservice establishments to comply with state and local food codes while also achieving corporate sustainability goals. 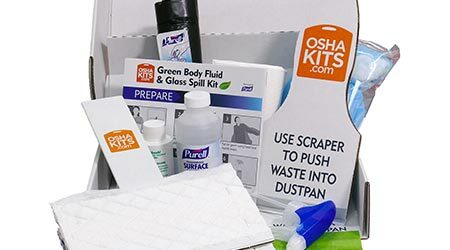 The Eco-Friendly Body Fluid Spill Kit is 83 percent decomposable and designed to be completely disposable. The kits also contain a specially engineered set of coated, long-handled cardboard scrapers, mop heads, and a closable waste pan sturdy enough to safely collect solidified and sanitized body fluids. Premium Food Safety Spill Kit is a refillable double-packed kit. The ready-to-use, food-contact-safe, OSHA-compliant Premium Food Safety Spill Kit contains two complete single-use kits for two separate body fluid spill events and ensures all biohazard cleanup materials can be accessed at once when needed. OSHAKits.com has added a set of proprietary tools designed to make cleanup faster and keep first responders safer. Each single-use kit contains a bilingual training guide, personal protective equipment for employees, and disposal supplies for the safe removal of fluids. Each type of Body Fluid Spill Kit features PURELL Foodservice Surface Sanitizer. The single-use bottle of PURELL Foodservice Surface Sanitizer helps disinfect spills and surfaces, with a 30-second kill time for foodborne pathogens like norovirus and salmonella as well as influenza.